Quick Links: Purchase this pattern for personal use or commercial use! 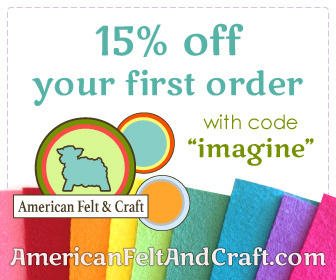 Introducing the newest pattern in the Imagine Our Life Etsy pattern shop. 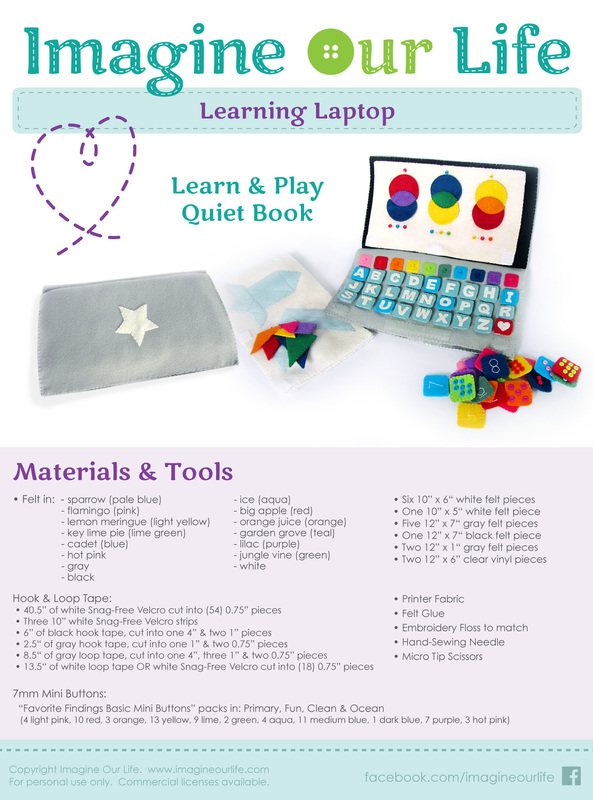 The Learning Laptop project makes a laptop-style quietbook with multiple activity sheets that pull out of a storage pocket and attach to the screen. 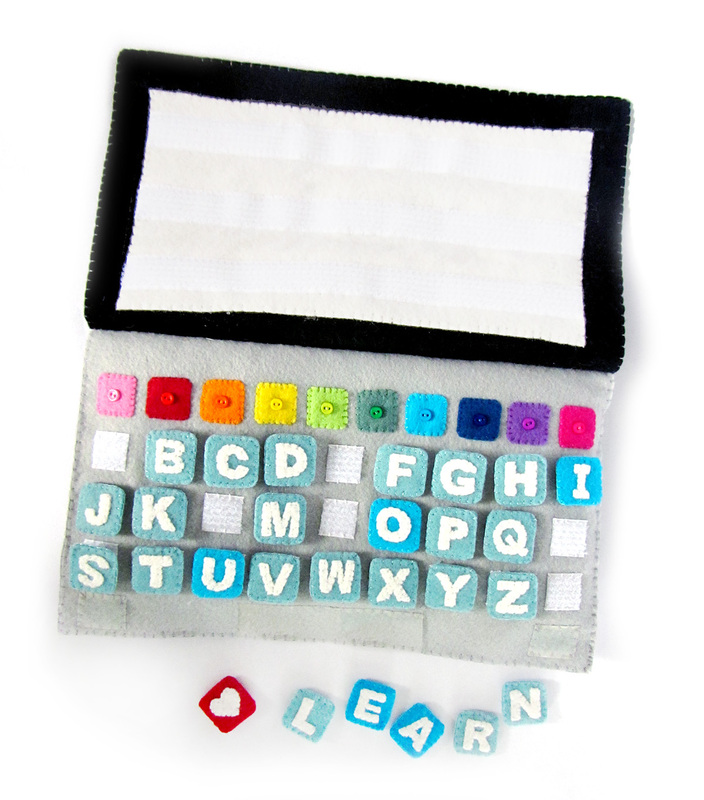 The “keyboard” is made of letters attached by hook and loop tape. Activities include: the alphabet, numbers (quantity, addition & subtraction), colors (matching & mixing) and tangrams (two difficulty levels). 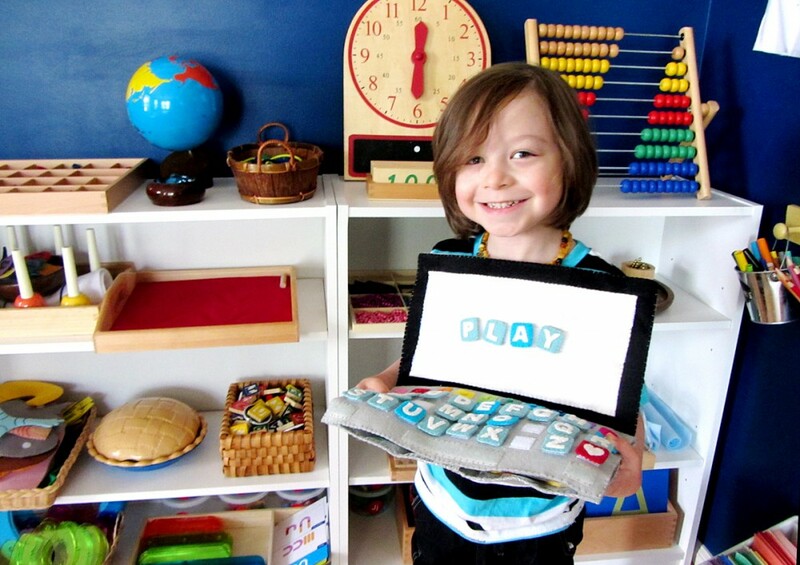 The keyboard lifts up to reveal storage pockets for all the loose parts and activity pages. This book is perfect for a broad range of ages, but I recommend children under three have adult supervision due to small parts. All the wool blend felt and vinyl in this project was provided by American Felt & Craft. The colors are all so beautiful, and I have a lot of leftovers to create more projects from. You do use quite a bit of hook & loop tape in this project. So much that I ended up not putting it on any of the loose parts beyond the alphabet. I used white Snag-Free Velcro for the screen and keyboard, then gray and black for the case. 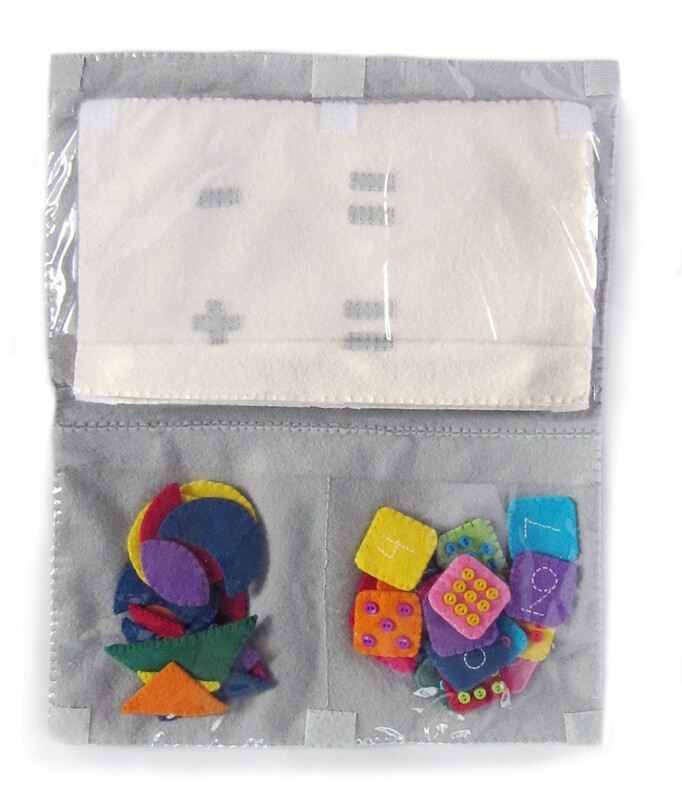 The only other special supply that is used is an assortment of colorful mini buttons. Mine were 7mm Favorite Findings Basic Mini Buttons in Ocean , Fun , Primary and Clean . I collected mine in craft stores, but I generally can find them online too. I have plenty leftover for other projects. The first thing you see when you open the Learning Laptop is the alphabet. It isn’t in qwerty, as it is meant to teach alphabetical order. (You would need to scale your letters down a bit to convert it to qwerty, as you’d need 10 instead of 9 on the top row.) The letters can all be pulled off and put back in the correct order, or used to make works on the screen. 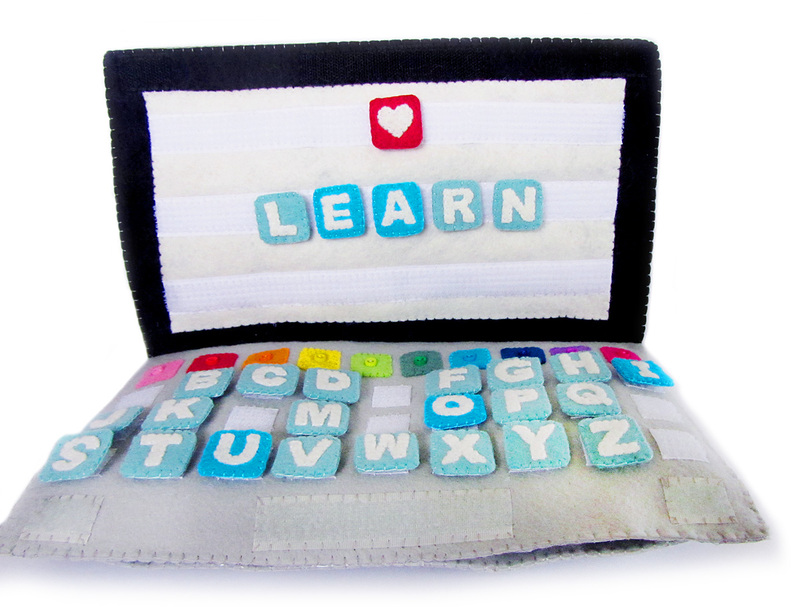 The basic pattern calls for one of each letter, but you can make extras and store them inside. I’d recommend extras if there are double letters in your child’s name. I chose two shades of aqua for my letters, separating the vowels with a darker shade. You can change them to all the same, or perhaps the classic Montessori red and blue combination. I added a little heart to fill in our extra space. There are two sets of number tiles that range 0 through 9. One set has buttons to show the quantity, the other has written numerals. 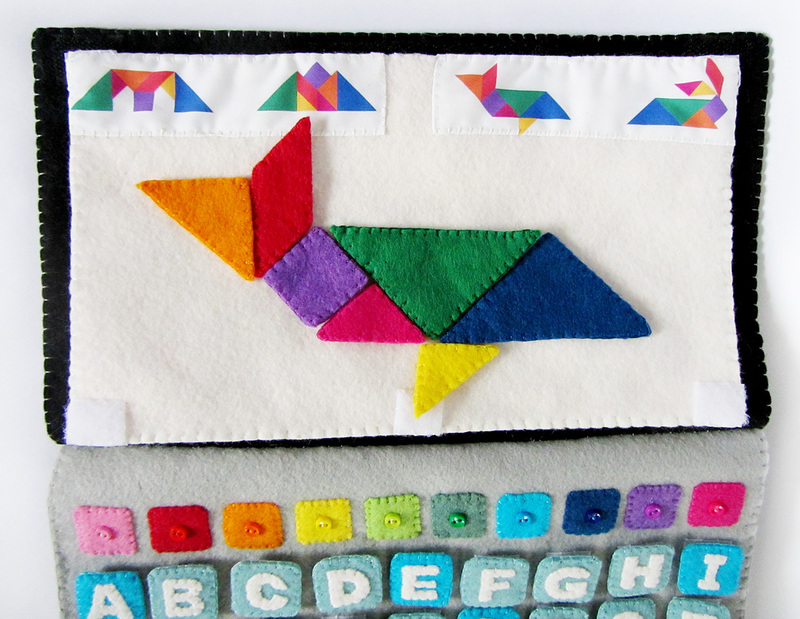 I chose not to match the felt colors between the two sets so that a matching game will be harder for my 4-year-old. 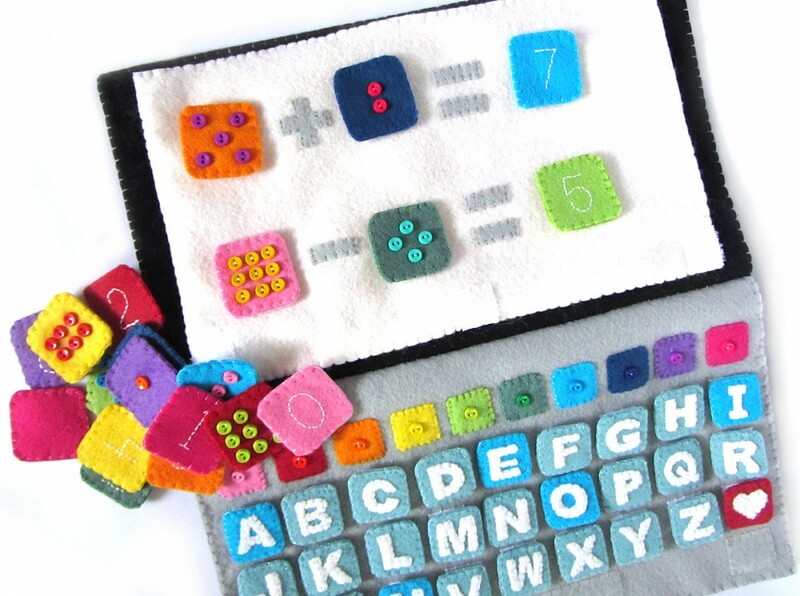 A younger child who is just learning number quantities might benefit from having the felt colors correspond. The Learning Laptop has three simple color puzzles. You could create additional pieces and add more button combinations if you wanted to. 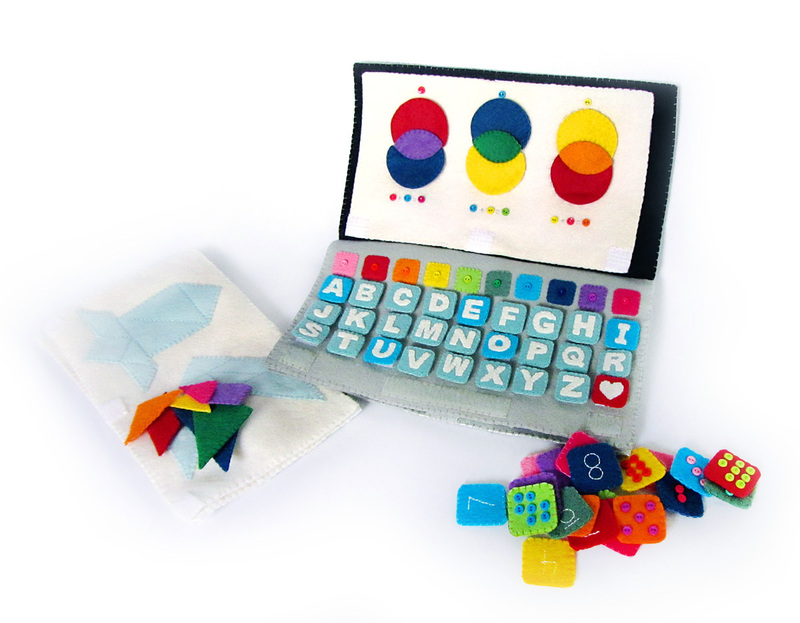 Included is a page that lets the child either sort the three primary colors into three puzzles, or they can follow the mixing equations to make the complimentary colors. The outer pieces are the same primary color on each side. The inner pieces are primary colors (red, yellow and blue) on one side and complementary colors (orange, green and purple) on the other. The tangram puzzle are Jax’s favorite! The pattern includes two sheets of full-size puzzles that have guide lines and two pages with smaller color examples of additional puzzles. This gives the child two difficulty levels to work through. 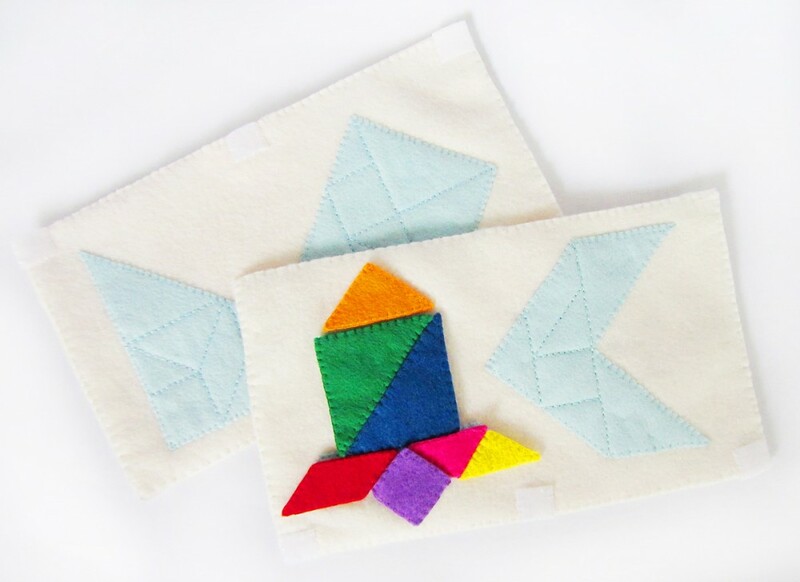 The tangrams are colorful and fun. Jax started out struggling with the easier puzzles, but after working out how to rotate and flip the pieces, he soon was able to move on to the harder puzzles. Now he is showing interest in creating his own! Everything tucks away into the storage section to keep it safe, though I help Jax clean up so we know nothing is missing. Jax in his Montessori homeschool room. Learn more here. Jax really adores this laptop quiet book and was so anxious for me to finish it! In honor of the tangrams being his favorite, I created a free pdf file with 12 additional puzzles in matching colors. Download it here. 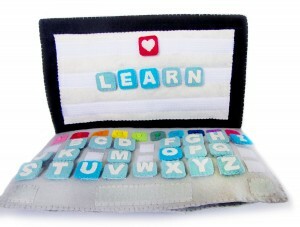 The Learning Laptop pattern can be purchased for personal use for only $8.00 here. 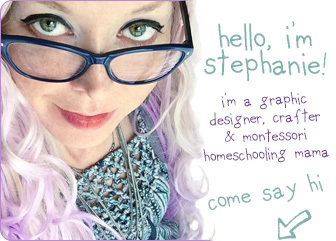 Your purchase helps me towards my goal of making this site my full-time job so I can share so many more projects with you. And, don’t worry! 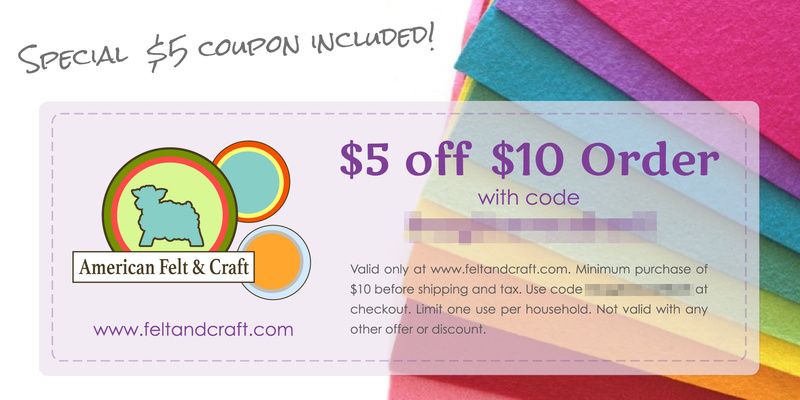 I will be mixing in plenty of free patterns! Plan to sell the finished product? Purchase a commercial license for $25 and sell as many as you like! 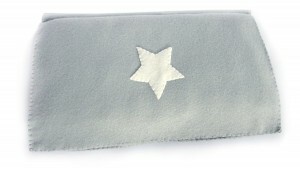 You will also be listed on my Authorized Sellers page. This entry was posted in Quiet Book, Sewing and tagged Patterns, Quiet Book, Sewing Projects on July 1, 2014 by Stephanie. Unreal!!! You are SOOOO talented. I DREAM of making things this beautiful and detailed! 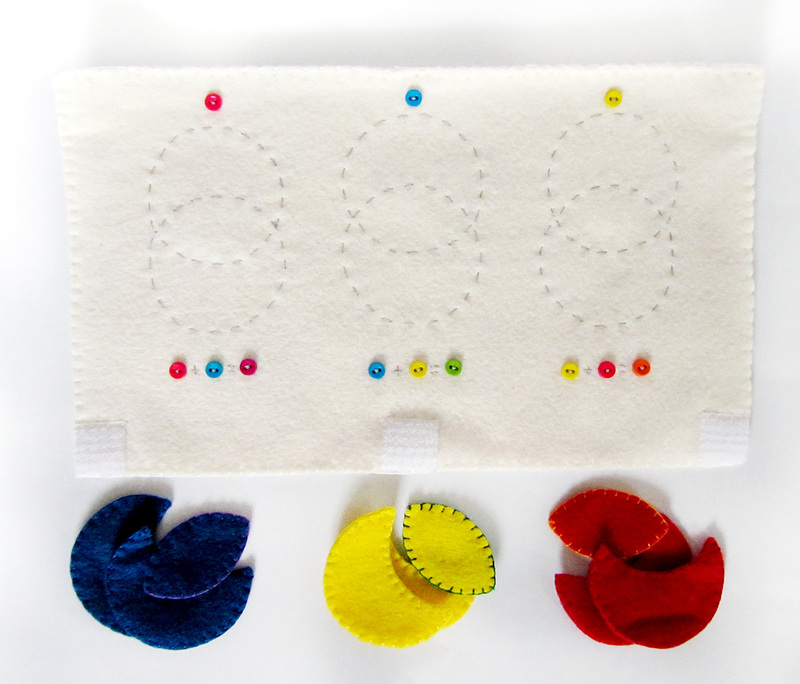 Do you hand-sew all those tiny buttons?? The whole project was hand sewn! Thank you! I’ve been reading and nose if I misunderstood but I have to put a product in front and one behind page for each product or have their thing and now this. 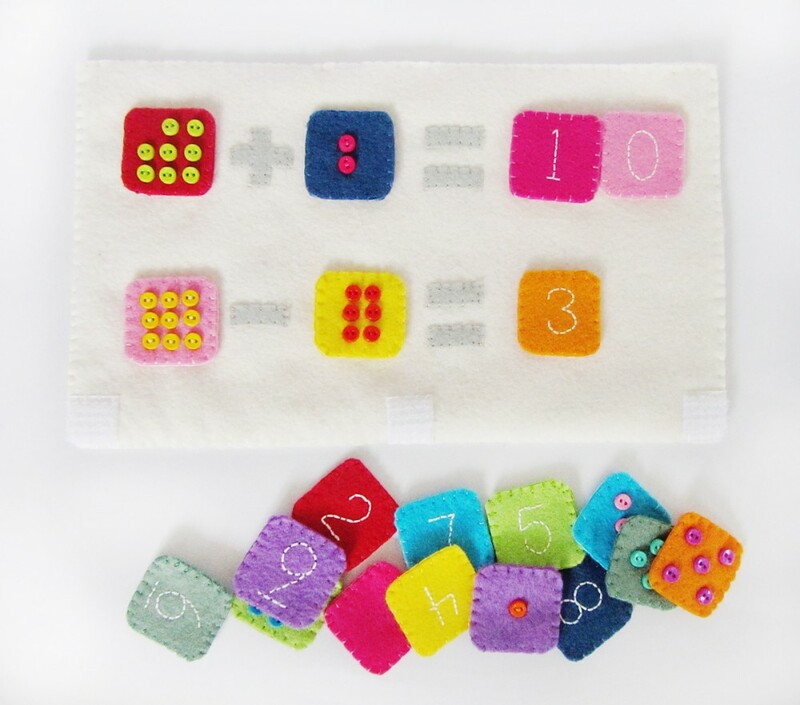 Hi Stephanie, I wonder if behind the written numbers and buttons computer template put velcro to engage or not?